If you know me, you know I love pasta — any type, shape, filling, flavor or sauce. As long as it’s cooked al dente, I’m in. 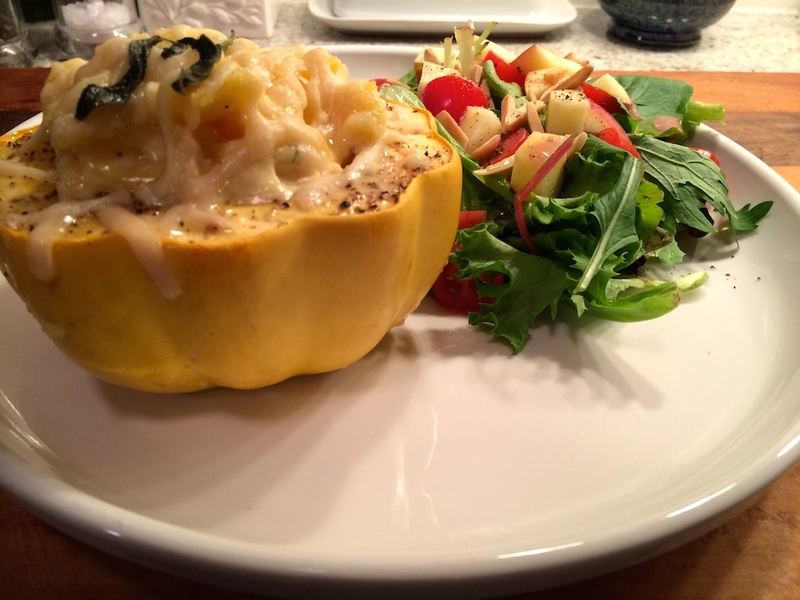 This is a great winter meal that combines pasta with roasted acorn squash with a pretty impressive presentation. And you don’t have to feel quite as guilty about the cream-based, cheese sauce since you have vegetables involved. So yes, it’s cheesy and rich, but it’s delicious and perfect for a dinner party since the presentation is so lovely. The sage on top is the perfect finisher. And for the record, another Tyler Florence. Any small stuffed pasta would work here — mini ravioli, etc. 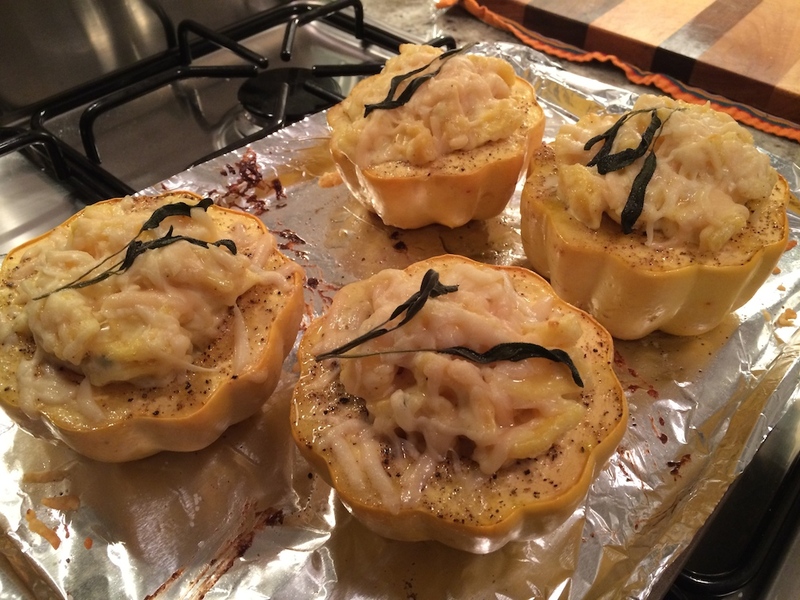 It took a while for the squash to cook through — longer than the recipe indicated. Make sure it’s done well by testing with a knife. Nothing is worse than crunchy squash. Reheating this meal isn’t easy — I scooped the whole bit out of the squash and reheated in a bowl. This is a heavy meal. Serve with a salad on the side. Preheat oven to 350°F. Cut the squash in half through the equator and scrape out the seeds with a spoon. Cut a small piece off the rounded edge of both halves to give them a base to sit on. Place the squash halves, cut sides up, on a baking sheet and sprinkle with salt and pepper. Drizzle with oil and roast for 25 to 30 minutes until tender. Cook the tortellini in salted boiling water according to package directions; drain well, reserving some of the pasta water. Set tortellini and pasta water aside. In a separate saucepan heat the cream over medium heat. Add garlic and thyme; cook 5 to 7 minutes, until liquid is reduced and mixture coats the back of a wooden spoon. Add the 1 cup the Parmigiano-Reggiano and the nutmeg, stir over low heat to melt the cheese. Toss tortellini into cream mixture. (Use some of the pasta water to thin sauce, if necessary.) Season with salt and pepper, then divide among cooked squash bowls. Turn the oven to 400°F. Sprinkle the tops with Parmigiano-Reggiano and fresh sage leaves; bake for 10 minutes more, until the cheese is melted and golden. 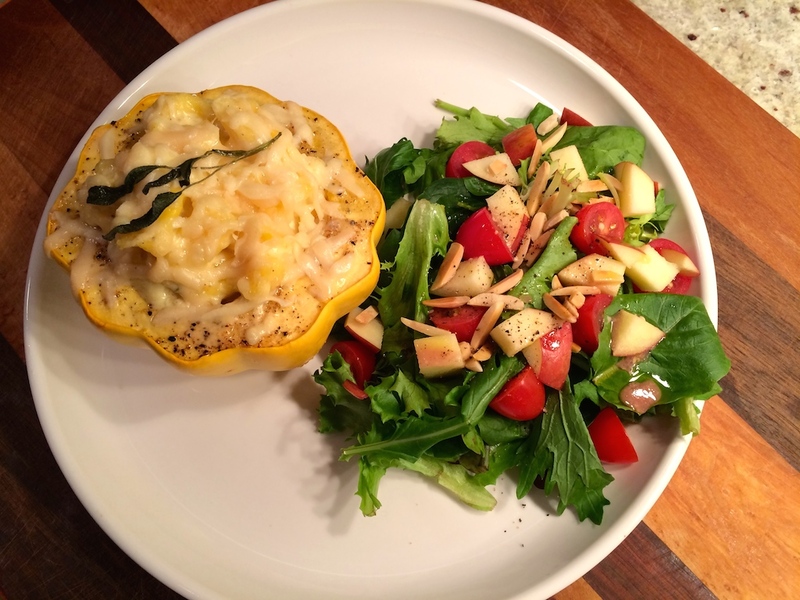 This entry was posted in Recipes and tagged pasta, squash, tortellini, Tyler Florence, vegetarian by Tricia. Bookmark the permalink.